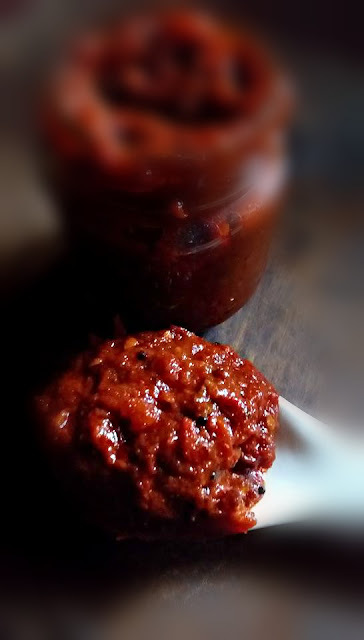 Thakkali thokku or Tomato thokku is a basic spicy preserve which almost all households prepare with little variations . It s kind of a pickle and can be made throughout the year as and when you get abundant fresh ripe tomatoes or when you face some extra over ripe tomatoes lying in the fridge. 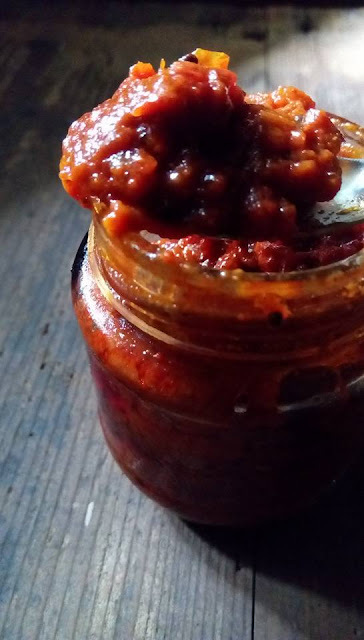 Best way way to save them is to make a thokku or preserve and use that in recipes when needed or as a tangy accompaniment to a variety of dishes. In the blog elsewhere I have some recipes with fenugreek leaves, onion tomato thokku and Tomato bell pepper thokku, each with few changes. The recipe below is the simplest basic recipe which you can adapt later by mixing other vegetables of your choice to make a new recipe altogether. Imagination is the key . 3-4 cups of finely chopped ripe tomatoes. A generous pinch of asafoetida powder. Tamrind should not be soaked in water and added, instead add it with tomatoes to cook along . Keep the tomatoes washed, dried well and chopped to smaller chunks. Roast the fenugreek seeds on a low flame till a fine aroma emanates. Keep aside to cool and grind to a smooth powder. In a hard based pan , add some gingelly oil after pan is heated well, add the mustard seeds . Let the mustard seeds crackle, lower the flame and add the chopped tomatoes. Add the turmeric powder, tamrind bit , salt, red chili powder and asafoetiida powder. Mix well with a ladle. Add the fenugreek seed powder . Reduce the flame to low and let the tomato mixture cook in its own juices on a low flame. Water should not be added . The tomatoes will release lot of juice on cooking so it is not necessary and also to keep the shelf life longer, do not ad water. This takes a while so keep checking on mixture by mixing from time to time, , cover with lid to cook if need be to avoid splashes as the mixture bubbles a bit.Add the pinch of jaggery at this stage. 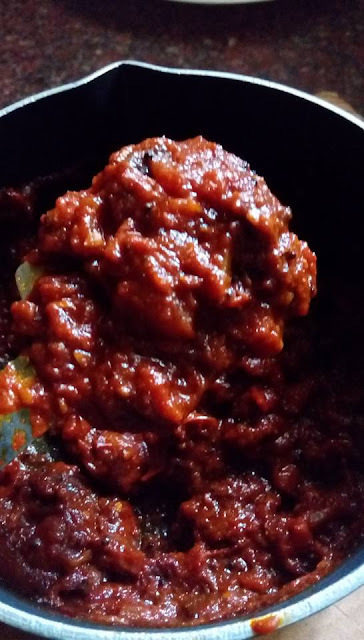 After 10 minutes you will see the mixture thickening well and tomatoes almost pulsed to smooth in their juices, and the oil floating on top. Remove mixture when thickened well and store after cooling completely in bottles . 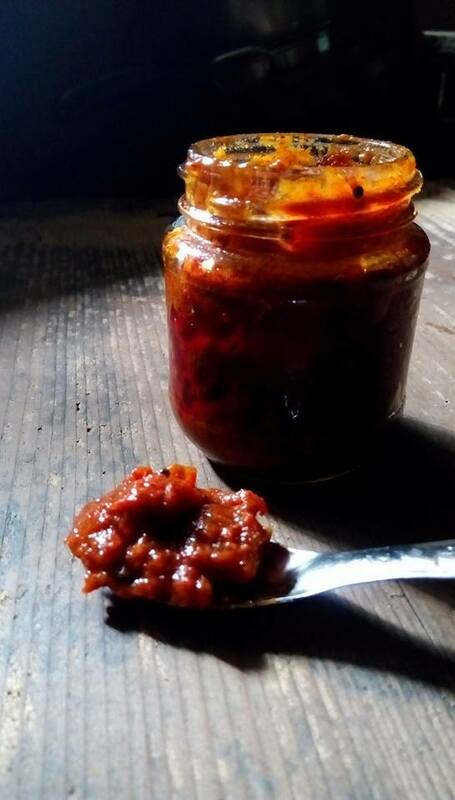 This makes an excellent side dish for several dishes mainly curd rice, chapatis, dosas, idlis and as a add on in some gravies too if you have run out of tomatoes. 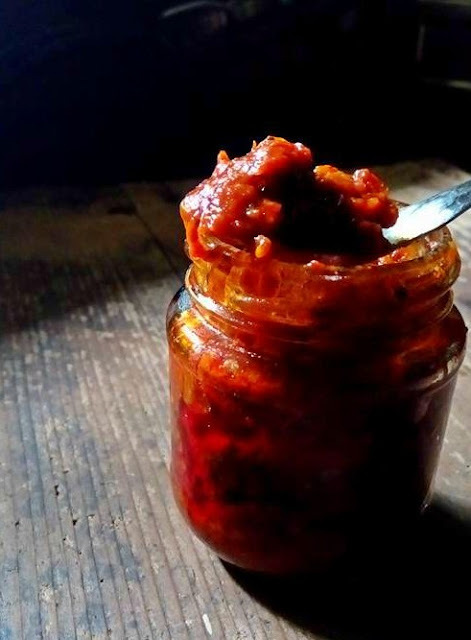 Yoou can make excellent tomato rice dish with this preserve. It s a multi use mix if you ask me . Enjoy which ever way but I assure you the aroma wafting from your kitchen while cooking this thokku is simply heady especially after adding the roasted fenugreek seeds powder.